7/12/2008 – Shortly after his rapid chess match against David Navara in Prague Vladimir Kramnik gave Czech journalist Pavel Motocha an indepth interview on Navara, chess ethics, the world championship title, his upcoming match against Anand and Garry Kasparov's political activities in Russia. An English language translation has appeared on the Kramnik web site. Here are the highlights. The following interview was conducted by Pavel Matocha after the rapid chess match between Vladimir Kramnik and Czech GM David Navara (Kramnik won 5.5:2.5). The interview was published in the Czech magazin "Weekly Euro". It has been translated into English and posted on the Kramnik web site (link below). We bring you highlights. David is a very strong grandmaster. In general he plays well – his strongest weapon is a very fast calculation of variations. I noticed already during our first game at the Wijk aan Zee tournament last January that he calculates incredibly quickly. Fast calculations are extremely important in rapid chess, there is no time for calmly contemplating a position. It is interesting, David is normally very modest and shy, but at the chessboard he is a very confident and tough player. I think he only lacks experiences competing against the very top players. He needs to learn what is it like to play the real top grandmasters. I myself went through something similar when I played my first games against Kasparov and Karpov. It was at that time that I learnt the difference between competing against players from the top ten or twenty, and to compete against the world number one or two. Positions which I considered to be winning all of the sudden were not. They kept putting up resistance, they were able to find new resources to defend in those unfavourable positions. [Kasparov would] sometimes stare into my eyes during a game, or make some grimaces.However I never took much notice of it. Part of my preparation for the World Champion match against Kasparov was to be ready for his off-board tactics. I did not to react to them at all. Once you start thinking about these things during the game, even analysing them, you’re caught. Look at the catastrophic record Vishy Anand has against Garry Kasparov. Kasparov managed to beat him almost everywhere they played, even though Vishy Anand has belonged to the absolute top players in the world for fifteen years. This difference cannot be explained purely in chess terms, there must have been some psychology. You can call me an old-fashion guy, but I still believe that the real chess championship is actually a match between the best players, not a tournament. So that is going to be the match which will take place between me and Vishy Anand this autumn in Bonn. The tournament in Mexico was from my point of view a huge compromise. The problem was that the situation around the World Champion title was still difficult even after my unification match against Topalov. There was a need to find an acceptable compromise. After the unification my aim was to come back to a final match contest for the world champion crown under the umbrella of FIDE. In all the years after defeating Kasparov I felt this responsibility. Anything else would not have been in accordance with chess history, and also not with the desire of the overwhelming majority of chess fans all over the world. It was always my goal to end the unhappy period when the World Chess Federation organised their ridiculous knock-out or round robin tournaments for the title. The problem was that the tournament in Mexico had already been agreed and I was informed that if I had refused to play there, the event would not have taken place at all. This would have ended in another impasse. So in order not to cause another split I, in the end, agreed to compromise and played the tournament, which FIDE called World Championship. The truth is I did not win in Mexico, the winner was Anand, and I will compete against him this year in the real contest for the chess crown. I attach ten times more attention to the coming match in Germany – consequently this event is ten times more important to me than the tournament in Mexico. Is Vishy Anand World Champion? It is not a question of simply yes or no. Anand won the tournament, which was called the World Championship Tournament, and I competed in that tournament as well. The International Chess Federation FIDE agreed to do it this way, so I have no right not to consider him the World Champion. A question is, however: what is the value of such a title? Similary I considered Kasimdzhanov to be a FIDE Champion, after winning the knock-out tournament in Libya. However I did not consider him to be the real champion. He had won a tournament and by FIDE’s definition he was a FIDE World Champion. But the value of this title was lower compared to the classical title won in a one-to-one match by Champions like Lasker, Spasski, Kasparov or me. The winner of the match Kramnik-Anand won’t be World Champion only from a legal point of view, he will be considered to be the World Champion and best chess player by the entire public. Will there be a repeat of the "toilet affair" in Bonn? Not at all. I am convinced that in the world of chess currently there is only one person from whom we can expect such behaviour. Vishy Anand has never taken pleasure in scandals, and neither have I. From a chess point of view you can expect a very balanced and tough match. My task is to play the very best chess in Bonn and to win the match. I disagree with him. It seems to me that his political opinions are empty. Garry is too destructive for my liking. According to him, everything in Russia is wrong, Putin did everything wrong . But that is simply not true. Garry’s approach to everything is just demagogic and destructive. I disagree with his opinion that the situation in Russia is as critical as he sees it. Of course Russia is not a democracy on the same level as countries such as Germany or France, but you cannot judge today’s situation without taking in the historical context. Russia had never been a democratic country in the past, so that is why the transition is not easy. Nevertheless, nowadays eighty percent of the Russian population is not forced to fight for their existence, as they had to, some ten, fifteen years ago. The interview was conducted by Pavel Matocha, a senior reporter and co-founder of the magazin "Weekly Euro". Pavel is the organizer of several important chess events and at the same time chairman of the Prague Chess Society, a civic association founded in 2004 aiming to aid developing chess life and chess culture in the Czech Republic. 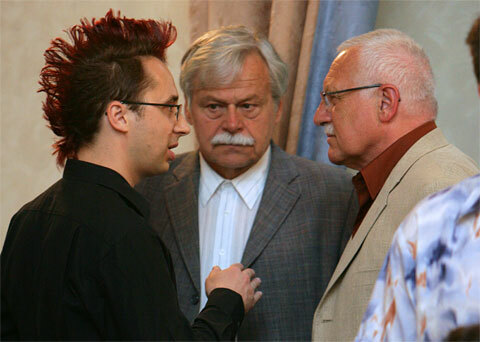 Pavel Matocha (left) with the Czech President Vaclav Klaus (right) and Grandmaster Vlastimil Hort (centre) during the match between Vladimir Kramnik and David Navara. Psychologist and a chess player Petr Bakalář conducted a curious chess experiment. Holding a chessboard he was walking through the historical centre of Prague, asking in turns locals and tourists to make the moves. His colleague video recorded the entire experiment. The locals, represented mostly by tourist industry workers, mated the foreigners in ten moves in this bizarre game. If you feel like continuing with this Bakalár’s experiment, you should contact the Prague Chess Society. "How about a match police versus homeless people at Central Train Station, skinheads versus anarchists during some sort of demo, or perhaps opposition versus coalition in the parliament?" the web site asks.